Who is Guns Save Life? We are a gun rights advocacy group, founded in roughly twenty years ago. We’ve grown rather dramatically since that first meeting of about a half-dozen people in a fast food restaurant. 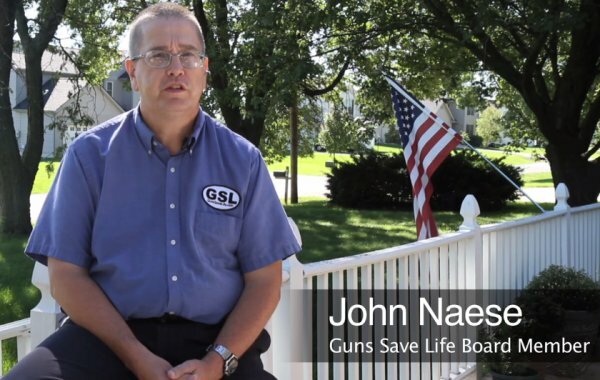 While we are affiliated with the National Rifle Association and the Illinois State Rifle Association, we are our own non-profit, dedicated to defending your right to defend yourself. In fact, that’s our mission statement: We defend your right to defend yourself. It’s on the masthead of our monthly journal, GunNews Magazine, which has a circulation of roughly 20,000 each month, primarily in throughout Illinois, but copies inevitably reach the eyes of movers and shakers and other influential people throughout the nation. We meet each month in six cities in Illinois: Champaign, Pontiac, Peoria, Springfield, Charleston, and Chicago. Yeah, Guns Save Life plays in Peoria, otherwise known as middle America. Depending on the city, we turn out between fifty and three hundred people every month. Every one of those folks are registered to vote, too. We have great speakers at our meetings, including war heroes, industry experts, and other interesting folks. History comes to life at our meetings as often as not, as participants from history come tell their recollections. We’ve had Bataan Death March survivors (at least two), USS Indianapolis sinking survivors, The USMC First Marine Division Breakout survivors (and officer and an NCO), and more recently, remarkable men from the sandbox (including one who survived multiple hits to his chest plate from an AK-47), a Pentagon 9/11 attack survivor, and one of the Americans held hostage in Iran under Jimmy Carter. Other times history comes to life with re-enactors and other historical experts. It’s not the history class you might remember from school! We’re famous for a lot of things. Our members lobby the Illinois General Assembly aggressively. We’ve gotten international publicity taking broken down, rusty junk up to Chicago to sell to the gun-hating do-gooders for perfectly good cash that we then use to buy ammo for kids to attend the nation’s longest running NRA Youth Shooting Camp. Oh yes, we also buy a couple of guns to give to a couple of lucky participants with Chicago’s money as well. We’ve saved two gun ranges in Central Illinois from extinction through publicity and expert advice – both ranges have since grown larger than they had ever been, and have expanded and improved their ranges and facilities. We’ve helped thousands of young people and adults supporting programs that promote the shooting sports and self-defense. We’ve also crippled anti-gun political candidates in Central Illinois, embarrassing them publicly and thwarting their efforts to score political gain by bashing guns. When it comes to politicians, if you bash guns, we bash you. Furthermore, to use an expression of the Greatest Gun Salesman of all time, we hit back twice as hard. We’re not so famous for some of the behind the scenes work we’ve done in the Illinois General Assembly, but that’s okay. While accolades are nice on occasion, results are more important to us. A couple of years ago, we were the subject of a video documentary entitled: “Handguns and Humor in the Heartland: A Gun Rights Group’s Unlikely Activism” by Stretch Ledford. There were several incarnations of this documentary and it was seen on “The Atlantic” website here in America titled, “Nothing Says Peace on Earth Like a Handgun for a Christmas Ornament“. Another version was shown by the Canadian Broadcasting Network. The British Broadcasting Network also featured yet another version on their website’s homepage for nearly a week and it was viewed by hundreds of thousands of people world-wide. The Brits find America’s gun culture hard to fathom and our passion for gun rights quite a novelty. The BBC thought us so interesting they sent a reporter and photographer from London to attend one of our meetings and interview us. We managed to score a copy of the Handguns and Humor documentary that didn’t feature words from the opposing side. We offer it here.